The last chapter of this thesis attempted to create insight in the logistic and informational network of the VOC, putting a particular emphasis on the contact with patria and Europe. This network is most clearly visible in case of long-distance campaigns, and for this reason the last chapter has to a large degree passed by the various campaigns that the VOC waged “closer to home”, i.e. within the Archipelago. These were usually waged entirely on the initiative of the Hoge Regering, and most of the time patria was only informed of them afterwards, making these wars a lot less relevant to the decision-making process as sketched in the last chapter. Nonetheless, the Company had its fair share of wars within the Archipelago, most notably with its two biggest Asian rivals: Bantam and Makassar. As these have been largely passed over in the last chapter, they will require slightly more introduction than the other campaigns in this chapter. For one, throughout the period here under study, Batavia had an on-and-off war with its closest neighbour, Bantam. In 1656, the sultan of Bantam, ever bent on breaking the trade hegemony of the Company, had taken two Company vessels and set fire to them. This hailed the start of a period when the Dutch structurally blockaded the Bantam harbour, and the Bantamese, in their turn, raided the Ommelanden and took as many prisoners as they could. Only by the end of 1659 did things quiet down again. The conflict with Makassar also had its origins in trade rivalry. Hostilities had started off as early as 1616, with the massacre of 15 Dutch sailors by the Makassarese. This massacre in itself had been a retaliation for several Makassarese nobles being taken hostage by the Company, in order to get the king of Makassar to pay his debts. The fifty years of on-and-off war that were to follow this incident, however, had a deeper-lying cause. The city of Makassar thrived mostly on the trade in spices. In the first half of the 17th century, the power of the Makassarese kingdom was ever growing, and the kingdom coveted a direct control over the spice-producing regions. At the same time, the Company was aspiring to a complete monopoly of these spices. The fact that not only Asian traders, but also Spaniards, English and the Portuguese found a warm welcome in Makassar, was a threat to both the Asian trade and the European spice market of the VOC. Particularly the Portuguese were strongly present in Makassar: their population numbered about 2000, living in their own quarter. They had a great measure of autonomy there, and were very influential with the Makassarese king. For all these reasons, the kingdom of Makassar and the ‘kingdom of Jakarta’ grew to be rivalling powers, very soon after the Company made its first entry into the Archipelago. At the beginning of our period of study, the aforementioned Ambonese wars were largely over. This conflict over the control of the spice-producing regions of the Archipelago had largely been fought out in the Moluccas; in the years 1654-1655, the harbour of Makassar had also been blockaded. As this war was costly and was severely hampering the spice trade, the directors back in the Netherlands were far from enthusiastic about it, and sent orders to Batavia to try and reach an agreement. Such an agreement was reached by Willem van der Beeck, and was confirmed by Batavia on the 2nd of February 1656. This treaty, a rather thin document that left a lot of room for interpretation, was to prove a Trojan horse to the Company. In the Generale Missiven of the following years, we find Maatsuiker constantly complaining that the treaty (which he himself had ratified) was way too lenient. Particularly clauses six and seven, which specified that the Company and the kingdom of Makassar would not interfere in each other’s alliances and conflicts, effectively meant that the Portuguese and the English still had a way into the spice trade. Clause eight requested that the king would not send ships to Ambon, and gave the Company the right to seize Makassarese ships trading in the Moluccas. Of course this didn’t stop the Makassarese from trying, and the Company’s maritime hegemony was not strong enough to make these attempts unprofitable. Makassar’s strength was the biggest check on solving these issues with violence. Even the hawkish Vertoog by Van Goens had advised to appease the kingdom, although the appeasement should be combined with larger garrisons in the Moluccas. As everyone within the Company was painfully aware, the Company could ill afford a war with Makassar, which had a large and professional army and by the 1650s was extremely well-fortified. Attempts at settling the differences by negotiation therefore continued. The king of Makassar, however, was also aware of his excellent bargaining position, and became ever more provoking in these negotiations. Things finally escalated when on the 27th of April 1659, the negotiator for the Makassarese demanded that the Company should take no action against Ceram, Buru and Amblau, which stood under the protection of Makassar but with which the Company had a conflict. In addition, the Company was to retreat from Menado, and had to admit that its monopoly on the Spice Islands was in contravention of God’s law. The Dutch negotiator, Bastinghs, replied that he was in no position to decide on these matters, and went back to Batavia. The Hoge Regering, upon hearing of the turn things had taken, decided that the fruitless negotiations had carried on long enough. Politics would just have to be continued by other means. On the Mars, one of the ships leaving for Ambon, the men that were to lead the expedition also left from Batavia: Johan van Dam, with Johan Truytman as second in command. The instructions for the commanders by the Hoge Regering were remarkably precise for an attack that was only going to take place months later. As the VOC force would simply not be strong enough to attack Makassar head on, some kind of subterfuge was needed, and the gentlemen in Batavia had it all worked out. First, the VOC employees that were still present in the Dutch lodge would have to be evacuated in some way. Then, the bulk of the fleet had to sail along the Makassarese coast from south to north, firing at the Makassarese defences as it went, until it would reach the large royal fortress Sombaopu. The goal was to create the impression that a large attack was going to take place on this fortress, which would then lure away the troops from the other strongholds. A small part of the fleet, which should remain out of sight until that time, consisting of smaller vessels and carrying the bulk of the soldiers, would then undertake a surprise attack and take the southernmost fortress, Panakoke. The Company being in possession of a fortress so near the Makassarese court would probably reverse the tables in the negotiations that were to follow. The Mars had arrived on Ambon on the 17th of March. A good five weeks later, by the 29th of April, the army had largely taken shape, and a day of prayer for the success of the expedition was held, even though reinforcements from the Moluccas had not come in yet. Interestingly enough, as with most VOC campaigns, the praying soldiers, sailors and citizens on that 29th of April did not know exactly what they were praying for: neither the sailors or soldiers, nor even the officers that were to take part in the expedition knew where they were going. Only Van Dam and Truytman did. To most observers it must however have been clear that it was not some small-time penal expedition, as the fleet was by now becoming formidable by Company standards: 31 vessels (including small boats), carrying 1200 European soldiers, 1000 sailors and 400 Ambonese: a total of 2600 people. Siege equipment was being produced and brought on board. Finally, two of the ships from the fleet set sail on the 7th of May to obtain additional supplies; the other 29 ships followed on the 12th of May. The fleet taking shape in the bay of Ambon. Print from Schouten. The fleet came to a halt at Selayar, the island under the westernmost ‘finger’ of Sulawesi, on the 5th of June. The city of Makassar was just to the Northwest. Before the plan that the Hoge Regering had spelled out could be put into effect, the three residents of the Dutch lodge needed to be gotten out of there. For this purpose, Van Dam went ahead with the Mars and the small flute Breukelen. As the Dutch had been continuously trading in Makassar in spite of the differences, the arrival of two Dutch ships before Makassar would hopefully not arouse suspicion. As soon as the ships would have returned and met up with the fleet, which was to slowly advance in the meantime, the attack would take off. Now, the two ships were in principle ready to head back to the fleet lying hidden behind Selayar. Circumstances, however, had inspired Van Dam to make a small change in plans. As the Mars and the Breukelen had sailed into the bay, they had spotted six Portuguese ships and a small Portuguese junk there, four of which were lying deep in the water and were presumably loaded with trade goods. During the night, before the third VOC employee was back on board, Van Dam had already decided to attack the ships in the morning. Although Van Dam only had two ships at his disposal, one of these was the well-armed flagship of his fleet. He had decided to take the risk. Just after the helper had arrived on the Mars, the attack on the Portuguese vessels began. Clearly the Portuguese had been on the alert, as fire was immediately returned. The fleets seemed evenly matched for a while, until, by a stroke of good fortune, the Mars, which was in close combat with the Portuguese lead ship, hit its powder chamber and thus destroyed the vessel. Two other Portuguese ships caught on fire soon after, two more were manoeuvred onto the beach. The sixth vessel was entered by the crew of the Breukelen and taken. Its crew was released to Makassar, and as the Makassarese defences also opened fire on the VOC vessels, the ships, now three in number, headed back to the fleet. The sea battle between VOC and Portuguese ships on the 8th of June. Print from Schouten. On the 11th of June the ships met up, and the entire fleet headed for Makassar. Apparently the Makassarese king was now aware of what was afoot. It is possible that the incident of three days before had made the king suspicious, but the fleet had also been spotted behind Tanakeke by a Makassarese vessel, as Wouter Schouten reports. At any rate, a Makassarese ship carrying a peace flag now approached the fleet, bringing cloth and gold as an indemnity for earlier damage on the Company. The gifts were accepted and the vessel was sent away. This acceptance of the gifts, however, did not mean any change in plans on Van Dam’s side. In the morning of the 12th of June, only half a mile south of Makassar, Van Dam and Truytman transferred to a fast yacht, the Kat, and the eleven largest and best-armed vessels transferred their soldiers to the other ships. These eleven would be performing the bombardment of the coast. The other ships, among which the Kat, would remain out of sight and then attack Panakoke, just as the Hoge Regering had ordered five months ago. Map of the coastline of Makassar. Print of the attack on Makassar, 12th of June 1660, from Wouter Schouten’s travel account. In the background we see the eleven most heavily armed ships bombarding Sombaopu, while in the foreground the smaller vessels land and Company pikemen make their way towards Panakoke. In spite of the damage done to these eleven ships, the plan was working out. The 4000 Makasserese defending Panakoke, under the impression that the main attack was on Sombaopu, rushed away to defend it. Only a small force remained behind. Then, Van Dam and Truytmans landed their force, well-equipped with siege equipment, at the beach near Panakoke. As Wouter Schouten describes, the small Makassarese force that had been left behind, realising that it was hopelessly outnumbered, decided to just abandon the fortress. However, as they opened the small gate to leave it, a company of VOC pikemen had already arrived near this gate, and stormed in, driving back the Makassarese soldiers, who now started jumping from the walls. The VOC army now entered Panakoke, bringing in cannon, powder, grenades and other weaponry, and hoisted the Dutch flag over the fortress. Now the troops in Sombaopu finally realised what was happening, and a large Makassarese force made for Panakoke to reconquer it, bringing one siege ladder which Schouten describes as utterly unusable. The VOC troops now loaded their heaviest cannon with scrap and fired at the huge crowd of soldiers below, and threw fire grenades. This treatment created chaos among the Makassarese forces, and soon the Makassarese army went into a disorderly retreat. Van Dam decided to do a sortie; VOC troops pursued the retreating Makassarese until the river Beerang, halfway between Panakoke and Sombaopu. On their way back to Panakoke, the troops set fire to the city, which burned down for a good part. The eleven ships before Sambaopu, meanwhile, had spotted the Dutch flag raised over Panakoke, and headed further north, particularly in order to bombard the Portuguese quarter of the city. The Portuguese, who were allowed their own defences within Makassar, returned fire. The fleet sailed all the way up to the northernmost fortress along the coast, Udjung Pandan. They carefully avoided hitting the English lodge, which was near there. The fleet then turned around to head back to Panakoke, not foregoing the chance to have another round of bombardment on the Portuguese quarter. The ship on which Wouter Schouten was sailing, however, got stuck in the ropes of the Portuguese admiral ship which Van Dam had blown up on that location four days ago. The Portuguese, noting that the ship was stuck dangerously close to the Portuguese guns, tried to hit it below the waterline in order to sink it. By another incredible stroke of fortune, however, one of the cannonballs apparently hit the rope in which the rudder of the ship was entangled. The ship came loose and managed to get away and return to Panakoke, which in the next few days would be defended with an extra trench. Only nine Dutch soldiers had died in the entire action. Thus, on the 12th of June 1660, the VOC, not powerful enough to fight an all-out war with Makassar, had caused it enough harm to be taken seriously as a negotiation partner again. The city was burning, the Portuguese quarter and the royal palace had been severely battered by artillery bombardment, and Panakoke was now flying the Dutch flag. The next day, ambassadors of the king arrived to negotiate. Now, it was the Company which made use of its excellent bargaining position; it simply sent the negotiators back as not being qualified to a sufficient degree. Van Dam subsequently demanded that the king sent a plenipotentiary to Batavia. Until negotiations were concluded, Panakoke would remain occupied as a guarantee. The Makassarese sent Crain Papowa to Batavia as an ambassador. There, a new treaty was reached on the 19th of August. This new agreement was much more precise, as well as much more severe, than the one agreed upon by Van der Beecke five years earlier. The treaty specified that Makassar would no longer interfere with the Company’s business in Menado, Bouton and Ambon, that Makassar was prohibited from sailing on Banda and Ambon, that it would pay an enormous war indemnity which would cover the cost of the entire operation, and, worst of all, that all Portuguese should leave Makassar, and the Company would have open trade there. This display of power and the resulting treaty had however not changed the deeper-lying causes of the enmity between Makassar and the Company. Although at first the king seems to have been earnest in ousting all the Portuguese from his capital, it soon became evident how important the Portuguese had been to the welfare of Makassar, and the king realised that he was ruining himself. In addition, the king was apparently not expecting the peace to last forever, as he started not only restoring but enhancing his defences before the treaty had even taken effect. When in 1663, rebels against the Makassarese king started taking refuge in Bouton, where Makassar was not allowed to interfere by the terms of the treaty, and Batavia was negotiating with the Bugis who were also in rebellion against Makassar, the atmosphere quickly turned sour. A series of incidents alternated with attempts to restore the peace by negotiation, made clear that it was only a matter of time before war would once again break out. In 1665, the Company evacuated its lodge in Makassar. 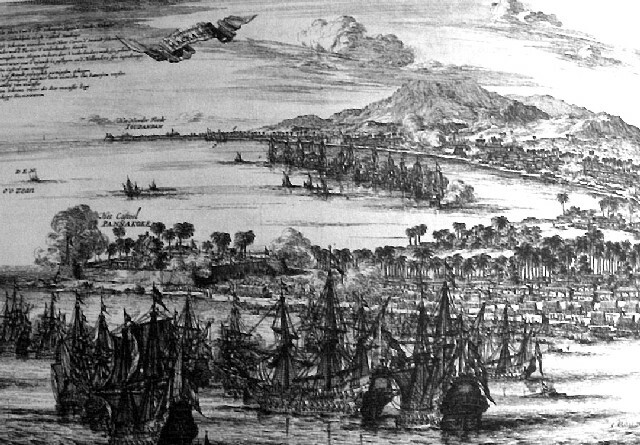 When by the end of 1666 the Hoge Regering suspected that Makassar was planning an attack on Bouton, Ternate and perhaps on Ambon afterwards, the Company once again took recourse to war: an expedition under Speelman was first sent to Bouton and Ternate, and would then have to go to Makassar, not so much to definitively defeat it as to once again flex the VOC’s muscles in the hopes of keeping Makassar at bay. As has been described in chapter two, so many local allies joined the fleet that Speelman felt confident to attack Sombaopu. After a siege of the city which lasted for more than two years, the backbone of Makassarese power would finally be broken in 1668. F. W. Stapel, Het Bongaais verdrag (Leiden 1922), 14-17. Corpus Diplomaticum, CCXVII, treaty of 28th of December 1655. For example Generale Missiven, III, 87-89, 147-148, 215pp. The latter pages are the letter of December 14th, 1658, when Maatsuiker is already contemplating an attack against Makassar, but adds that he will wait, as disease and other campaigns are tying his hands. In February 1657, Dirk Schouten was sent to Makassar to negotiate. He died there, apparently of natural causes. A letter from the King sent back by Schouten’s associate gave no reason for optimism with regard to future negotiations. Stapel, Bongaais Verdrag, 56-57. W.E. van Dam van Isselt, ‘Mr. Johan van Dam en zijne tuchtiging van Makassar in 1660’, in: Bijdragen tot de Taal- Land- en Volkenkunde van Nederlands-Indië (60: 1906), 1-44, there 9-10. This article forms the basis for this paragraph: footnotes only added for other sources. Interestingly, Schouten does not seem to be aware that the ships only went ahead to evacuate the lodge. He seems to be under the impression that Van Dam was going to do a last attempt at negotiation. Van Dam did no such thing. Schouten Oost-Indische Voyagie, 94, comp. Van Dam van Isselt, ‘Tuchtiging Makassar’, 15-17. Van Dam van Isselt, ‘Tuchtiging Makassar’, 16-18. Van Dam van Isselt, ‘tuchtiging Makassar’, 21-24; Stapel, Bongaais verdrag, 66-67; Corpus Diplomaticum CCXLIII, 19th of August 1660.